Once when Mahāprabhu and Nityananda Prabhu came to his house in Srikhanda, they suddenly expressed a desire for honey. Narahari demonstrated his miraculous powers by transforming the water in a pond near his house into honey. Ever since he quenched the Lords’ desire for honey with water from this pond, it has been known as Madhu-puṣkariṇī. The Lord gave Narahari the order in a dream to install three deities of Himself, which are currently worshipped in Srikhanda, Katwa and Ganganagar. adhunā narahary-ākhyaḥ sarakāraḥ prabhoḥ priyaḥNarahari Sarkar, the Lord’s dear associate, was previously Radha’s intimate girlfriend named Madhumati. (Gaura gaṇoddeśa dīpikā 117)Śrīla Narahari Sarkar Ṭhākura is counted as one of Chaitanya’s branches on the desire tree of pure devotional service. By Mahāprabhu’s desire, he took birth in a physician (vaidya) family, blessing his family when he did so. He was foremost among the Lord’s associates of the village of Srikhanda. Narahari’s home is about one mile from the Srikhanda railway station near Katwa in the Burdwan district. Some of the other prominent residents of Srikhanda who were devotees of Lord Chaitanya were: Śrī Mukunda, Śrī Raghunandan, Śrī Chiranjiva, Śrī Sulochana, Śrī Damodar Kaviraj, Śrī Ramachandra Kaviraj, Śrī Govinda Kaviraj, Śrī Balaram Das, Śrī Ratikanta, Śrī Ramagopala Das, Śrī Pītambara Das, Śrī Sachinandana and Sri Jagadananda. Kṛṣṇa Das Kaviraj Gosvāmī mentions many of these names as Chaitanya’s branches that generously distributed the fruits of love of God. In Bengal, in the area known as Rarha (Burdwan, Birbhum), there is a famous town known as Srikhanda that gave shelter to all the physician clans. Since vaidyas gathered there, it became a favored residence for them, especially those who were of the noblest birth. In the Gauḍīya Vaiṣṇava Abhidhāna, it is stated that Narahari Sarkar Ṭhākura appeared in either the Śaka year 1401 or 1402 (1480-81 AD). His father’s name was Śrī Narayan Das, his mother Śrī Goyī. Goyī was the daughter of Murari Sen. Narayan Das had three sons, Mukunda, Madhava and Narahari. Raghunandan Ṭhākura, whose darsan would drive away all the material afflictions, was Mukunda’s son. The author of Chaitanya Maṅgala, Lochana Das, who came from a remote village near Jhamaṭpur, was Narahari’s disciple. For this reason, Lochana Das writes that Śrī Gadadhar Das and Narahari Sarkar Ṭhākura were Mahāprabhu’s dearest associates. On the other hand, in Chaitanya Bhagavat, Vrindavan Das Ṭhākura has not spoken at any length about the devotees of Srikhanda. Narahari Das Ṭhākura is my worshipable master. He was the descendent of an esteemed line of physicians; his body was permeated by love for Kṛṣṇa, and he taught his disciples nothing other than Kṛṣṇa-prema. He was previously known as Madhumati, one of Radha’s dearest sakhis in Vrindavan, a storehouse of sweetness. Now in the Age of Kali, along with Gauranga, he has become the keeper of the storehouse of love for Radha and Kṛṣṇa. Narahari and the other residents of Srikhanda fanned with the cāmara, while Sañjaya, Mukunda and Vasu Ghosh sang. Narahari wrote several books, including Bhakti-candrikā-paṭala, Śrī-Kṛṣṇa-bhajanāmṛta, Śrī-caitanya-sahasranāma, Śrī-Sacinandanāṣṭaka, Śrī-Rādhāṣṭaka, etc. All of these are well known and thought of highly by the devotees. The following story is told about Narahari: Once when Mahāprabhu and Nityananda Prabhu came to his house in Srikhanda, they suddenly expressed a desire for honey. Narahari demonstrated his miraculous powers by transforming the water in a pond near his house into honey. Ever since he quenched the Lords’ desire for honey with water from this pond, it has been known as Madhu-puṣkariṇī. 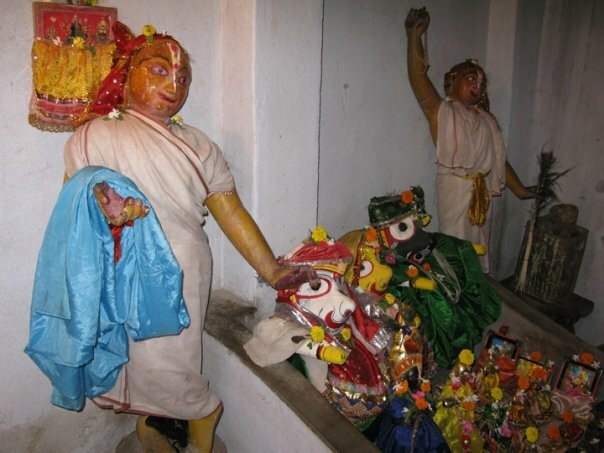 The Lord gave Narahari the order in a dream to install three deities of Himself, which are currently worshipped in Srikhanda, Katwa and Ganganagar. Narahari Sarkar Ṭhākura also participated in the Lord’s activities in Puri. He and the other residents of Srikhanda were amongst those who went every year with Shivananda Sen (Chaitanya Charitamrita 2.1.132). When Mahāprabhu returned to Puri after His pilgrimage to South India, where He had saved so many people by giving them love for Kṛṣṇa, Nityananda Prabhu sent Kālā Kṛṣṇa Das back to Bengal to tell everyone that Mahāprabhu was back. The Bengali devotees immediately made arrangements to go to Jagannath Puri to see the Lord. The residents of Srikhanda (the Khaṇḍa-vāsīs) werecounted amongst them. Mukunda, Narahari and Raghunandan from Srikhanda arrived at Advaita Acharya’s house to go to Nilachala. After the Snana Yatra, Lord Jagannath would not be available for darshan. Out of the separation from the Lord, Mahāprabhu would go to Alalanath and returned to Puri when He heard that the devotees from Bengal were arriving there. 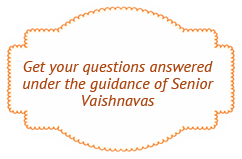 When Sarvabhauma Bhattacharya asked Gopinath Acharya to identify the Lord’s devotees, he mentioned the names of Narahari, Mukunda Das, Raghunandan, Chiranjiva, Sulochan and other Khaṇḍa-vāsīs as the dearmost of Chaitanya Mahāprabhu. During the Rathayatra festival, the Lord formed seven kirtan groups with the devotees from Bengal. One of these was composed uniquely of the devotees from Srikhanda. Kṛṣṇa Das Kaviraj Gosvāmī writes that Narahari Sarkar Ṭhākura and Raghunandan were the dancers for this group. When the Lord gave Mukunda, Raghunandan and Narahari directions for service, He told Narahari to remain in the association of devotees. Many people confuse Narahari Sarkar Ṭhākura with the author of Bhakti ratnākara, Narahari Chakravarti. The latter, who is also known as Ghanashyama Das, was born in the district of Murshidabad. His father’s name was Jagannath Chakravarti and was a disciple of Vishvanath Chakravarti. On Govindajī’s order, he was engaged as the cook for the Govinda temple and was known as the “cooking pujari” (rasuiyā pujari) in Braj. If Gaura came back to Nadia town, my mind would be filled with joy. Then I would see Him, the source of all joy, performing His kirtan pastimes. Hari Hari! When will I again gaze upon that moon-like face? When will that day come when the dam holding the ocean of separation in my heart breaks? When will I see the golden form of the Lord, wrapped in His yajña-sutra? Lifting my arms in the air, I will shout “Hari! Hari!” and dance in the midst of the devotees. Saying such things, many of Gaura’s devotees close their eyes and merge into love for Him. When will Narahari’s desires be filled? When will he gaze again upon the form of the young Gaura?